Timers work. Alarms work. So do challenges and deadlines for getting things done. When a timer buzzes when you're in the kitchen you go check on whatever you're cooking. When a smoke alarm goes off you know that it's time to take action and do something different, like turn on a fan or open a window or worse get out of a burning house. So if you want to launch or relaunch your book, give the proven RockPaperStar 5 day challenge a shot. This simple program will provide you with the guidance to set a big picture goal for your book launch or relaunch. To get a plan in place for your PR, marketing, sales and other efforts to increase sales. The 5 day challenge shows examples of how to email your network and invite them to help you promote your book. It also generates ideas for book sponsors, book launch events and more. What are you waiting for? Smoke to come from inside of your books to encourage you to start marketing and selling them. No one can sell a book as good as an author. 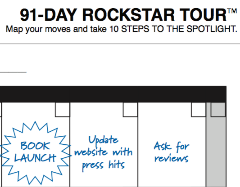 Start making a plan, in fact, the 91 day ROCKSTAR Tour plan and you'll see results.